An ode to Cuban spirit, carved in stone and marble! The landmark of Havana - El Capitolio - is celebrating its 90th anniversary this year. This impressive edifice was inaugurated in 1929 during the Gerardo Machado administration and has been undergoing a scrupulous and complete restoration since 2013. The building was conceived as a part of an ambitious goal of the president Machado to renovate the city of Havana for the upcoming Pan-American Conference in 1928, but it had not been completed by that date. Originally the Capitolio housed Cuban government. However, after the Revolution, it became the headquarters of the Ministry of Science, Technology and the Environment, and was opened to the public as a museum and a library. After all, it was recently announced that the Government of Cuba would move back into the building once the restoration works are completed. The Capitolio represents at the same time both the glorious past and the bright new future of this Caribbean island. Majestic and grandiose, this architectural masterpiece in neo-classical style leaves no one indifferent. Sumptuous interiors with palatial chandeliers, gilded lamps, bronze statues, precious hardwoods and marble floors struck the eye. Inspired by Paris's Pantheon and Rome’s St. Peter’s Basilica, the Capitol’s dome rises 92 meters above Havana and used to be the third highest in the world at the time of its completion. The construction of the edifice was a challenging large-scale project. It demanded more time and investments that had initially been planned. The cost together with adornment and furniture ultimately reached more than 16 million pesos. When the work began, the required equipment and materials were not on hand, and so needed to be imported, as, for example, different types of Italian marble or hundreds of tons of rock and steel. About 8 000 workers worked on the site in eight-hour shifts to complete the building in about three years. The building itself comprises almost fifty thousand square meters of total space and also boasts exterior gardens decorated with Italian sculptures. Following the royal French tradition, the Capitol gardens were designed by a famous French landscape architect Jean-Claude Nicolas Forestier. Besides its imposing allure, the most visited architectural monument of Havana also hosts the Zero Kilometer of Cuban highway networks. Embedded on the floor under the remarkable dome of the Capitol, a five-pointed star used to hold a 25 carats diamond (5 g) that, according to a legend, once belonged to a Russian Tsar Nicolas II. Today, the original diamond is stored at the Central Bank of Cuba and is replaced by a replica. 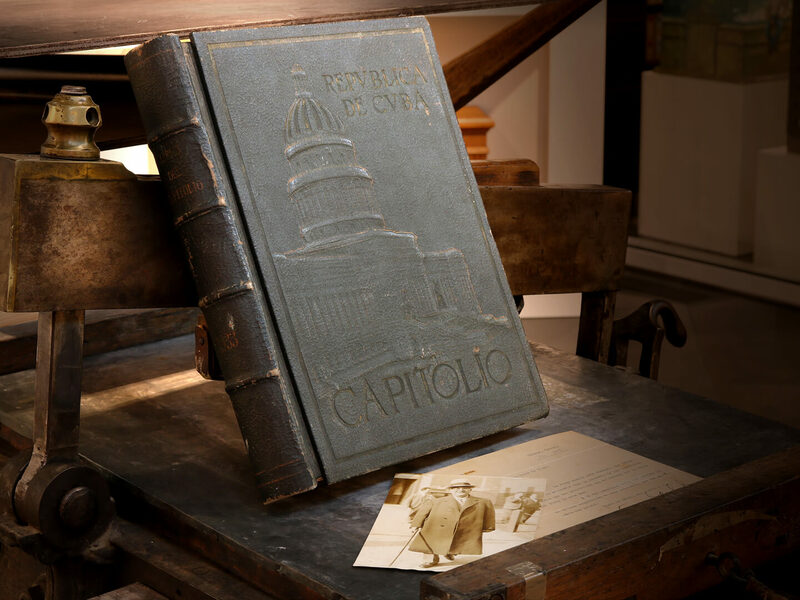 We are delighted to present you in our Art and Culture area an exclusive piece - a grand book "El Libro del Capitolio", explaining all the details and peculiarities of the construction and execution along with photos of the architects and engineers, which was printed in 1933 in Cuba. You will also discover the original photos of the President Gerardo Machado.